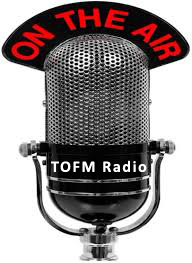 The event of all times! The key theme of the Word of God! None will miss it! You cannot hide from it! You cannot escape it and regardless of where you turn, it will find you! When it happens, all will know, and those who are Christ’s will be caught up to meet Him in the air. It is soon, even at the door. There are two distinct ways of approaching it: in boldness to life or in terror to death. Why not decide to face it unto life rather than onto death. Like it or not, afraid or not, knowingly or not, it is coming. How will you stand on that great day? 1. Will Jesus return for His people? “Christ was once offered to bear the sins of many; and unto them that look for him shall he ______ the second time without sin unto salvation,” (Heb. 9:28). 2. How does Jesus assure us of His return? “And if I go and prepare a place for you, I _____ come again,” (John 14:3). 3. How did Jesus assure John of His return? “Behold, I come quickly.” “And, behold, I come quickly; and my reward is with me.” “Surely I come quickly,” (Rev 22:7, 12, 20). NOTE: There is no doubt about it. The words of Jesus are plain. So let us “Therefore be patient, brethren, until the coming of the Lord…Establish your hearts, for the coming of the Lord is at hand,” (James 5:7, 8, NKJV). The Bible gives telltale signs of the second coming of Christ. These signs will be witnessed in the economic, political, scientific, physical and religious worlds so that all will know. 4. Where will the signs appear? “And there shall be signs in the ____, and in the _____, and in the _____; and upon the earth distress of _________, with perplexity; the _____ and the waves roaring; Men’s hearts failing them for fear, and for looking after those things which are coming on the earth: for the powers of heaven shall be shaken,” (Luke 21:25, 26). 5. When did Jesus say that the signs would begin to happen? “But in those days, _______ that tribulation,” (Mark 13:24). 6. What did John says would happen to the sun, moon and stars? “The sun became ______ as sackcloth of hair, and the moon became as ______; And the stars of heaven ____ unto the earth,” (Rev. 6:12, 13). NOTE: Many believe that these signs are yet to come; however, the first signs in the sky occurred at the end of persecution and just prior to the close of tribulation in 1798. On May 19, 1780, the sun was darkened and that same night the moon appeared as blood. (Actually notes from that day). 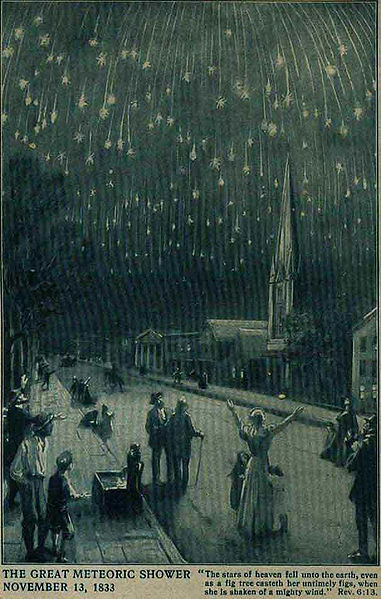 Then on November 13, 1833, the heavens seemed ablaze as the greatest meteoric shower ever to be recorded was observed over North America. Meteors were falling at a rate of 60,000 per hour. 7. What would happen on the earth? “And I beheld when he had opened the sixth seal, and, lo, there was a ______ earthquake,” (Rev. 6:12). 8. How is the worldwide economy described? “Go to now, ye rich men, weep and howl for your __________ that shall come upon you. Your riches are corrupted, and your garments are motheaten. Your gold and silver is cankered…Ye have heaped treasure together for the last days…you kept back by fraud,” (James 5:1-4). 9. What will be the political condition? “And the nations were ______,” (Rev. 11:18). “Wars and rumors of ______: see that ye be not troubled: for all these things must come to pass, but the end is not yet. For nation shall rise against nation, and kingdom against kingdom,” (Matt. 24:6, 7). 10. What will the scientific world be like? “Shut up the words, and seal the book, even to the time of the end: many shall run to and fro, and ______________ shall be increased,” (Dan. 12:4). NOTE: Like never before in History, knowledge is increasing at a rapid pace. We have gone from desktop computers to handheld and from getting lost to Global Positioning Devices on our cell phones. 11. What will the geological atmosphere be like? “And there shall be ________, and ___________, and ___________, in divers places,” (Matt. 24:7). NOTE: See U.S. Geological Survey: Science for a changing world. 12. What will the religious world look like? NOTE: Many attend church not because they love God or even because they believe him, but rather because they want to be called Christians. Today, in the church, you have many who do not believe that God created the world in seven days, while others do not believe he forbids homosexuality. Still, many refuse to accept that His law never changes although He says, “It is easier for heaven and earth to pass, than one tittle of the law to fail” (Luke 16:17). 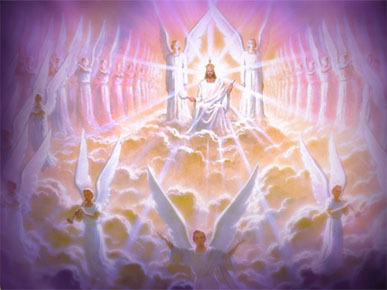 Although there are many teachings as to The Teamner of Christ Second Coming, the Bible leaves no room for doubt as to the way in which Christ will return the. 13. Who will see it and will it be a secret? “He cometh with clouds; and ______ ____ shall see him, and they also which pierced him: and all kindreds of the earth shall wail because of him” (Rev. 1:7). NOTE: Christ does not appear secretly to the saved, but to every living soul on the earth: just and unjust. 14. Will it be silent? “The Lord himself shall descend from heaven with a _______…with the trump of God.” (1 Thess. 4:16). 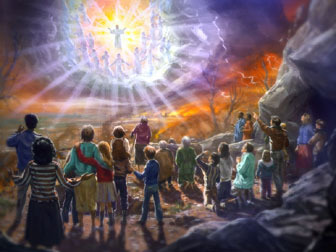 NOTE: While many churches teach the Secret Rapture, the Bible not only says that Christ Second Coming will be visible by all, but it will be extremely loud. So loud in-fact, that it wakes the dead. 15. What will it look like? “While they beheld, he was taken up; and a cloud received him out of their sight. And while they looked stedfastly toward heaven…two men stood by them in white apparel; Which also said, Ye men of Galilee, why stand ye gazing up into heaven? This same Jesus, which is ______ ___ from you into heaven, shall so come in _____ ________ as ye have seen him go into heaven” (Acts 1:9-11). 16. When do the saved go to heaven? “Let not your heart be troubled: ye believe in God believe also in me. In my Father's house are many mansions: if it were not so, I would have told you. I go to prepare a place for you. And if I go and prepare a place for you, I will ______ _______, and receive you unto myself; that where I am, there ye may be also,” (John 14:1-3). NOTE: Jesus will take us to heaven when at His Second Coming. 17. Is anyone in heaven now? 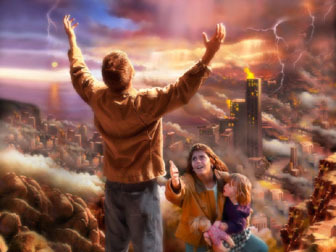 “Marvel not at this: for the hour is coming, in the which ____ that are in the _________ shall hear His voice, and shall come forth; they that have done good, unto the _____________ of life; and they that have done evil, unto the resurrection of damnation,” (John 5:58, 29). 18. Do you understand that when Christ returns it will not be a secret and all will see Him?